The first rockets were filled with solid fuel and composed of a paper or metal tube, filled with a slow-burning composition (black powder). A conical hollow in the length of the fuel column was spared, which, at ignition, served to spread the fire over a large surface, so that immediately a large quantity of heated gas was produced. This made the reaction power which propelled the rocket. The Chinese invented the use of war rockets; the war rockets were introduced in Western Europe in the first half of the twelfth century. In the beginning, the rockets were armed with an incendiary head. Later the larger rockets were equipped with exploding shells. The Englishman William Congreve developed the primitive rockets so that they could be used more efficiently as weapon of war. However, due to their poor accuracy the rockets were only used against large area targets. The destructive power of such rockets should not be underestimated: during the bombing of Copenhagen in 1807 the English fired 40.000 rockets over a period of three days, destroying a major part of the city. The rockets had a 6700-7000 meter range, and this was more than the heaviest canons could have reached at that time. A rocket with a black powder fuel attained a speed of 833 kilometers per hour. This speed could be increased up to 1108 kilometers per hour by using smokeless gunpowder. The power could be considerably improved by adding oxygen into the combustion; rockets with oxygen or oxydiser could reach a speed up to almost 1800 kilometers per hour. 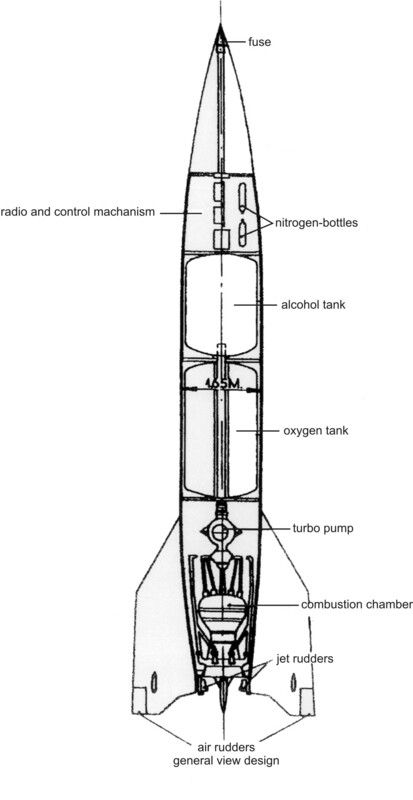 Traditional rockets were driven by solid fuel; the modern German rockets, such as the V2 and the anti-aircraft rocket Wasserfall, were driven by liquid fuel. Liquid fuel produced more power, but in practice could not be stored for prolonged times. So the rocket had to be fuelled immediately before launching. 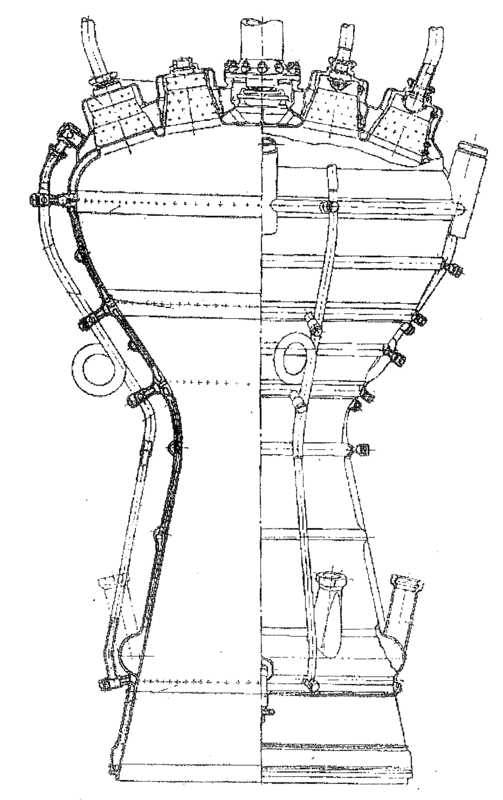 Cross section of a V2-rocket on which the principal components are indicated. The present war rockets usually have solid fuel, because this is easier to store. Also is the reaction time of a rocket, permanently filled with solid fuel, shorter. The V2 was a ballistic rocket. The rocket ascended vertically over 4 seconds, after which it followed the programmed trajectory. The rocket ascended over a period of 43 seconds at an angle of 47°. After approximately 65 seconds the fuel supply was cut off to stop the rocket motor. The projectile described a parabolic trajectory and reached a maximum altitude of approximately 97 kilometres. After reaching the highest point of the trajectory (the so-called culmination point), the rocket started a free fall on the target. At this point a small number of the rockets exploded due to passing through the atmosphere at a wrong angle (Luftzerleger). The range of the rocket could be influenced only in the first stage of the trajectory, namely at the moment the fuel supply was cut off. The minimum duration of combustion was 45 seconds, which resulted in a firing range of 80 kilometres. The maximum duration of combustion (about 70 seconds) could be attained without cutting off the fuel supply, when the rocket used all the fuel. The rocket could reach 295 kilometres with a variation of 35 kilometres either way. This is why an effective attainment of 260 kilometres was used. The Dutch resistance estimated the number of failed launchings at 8.4 %. This concerns only the failures exclusively at, or immediately after the take-off. Furthermore a number of the rockets didn’t survive the return into the atmosphere, as mentioned above. The flight of other rockets was beyond control, plagued by gyroscope problems. These disturbances appeared before the cutting off of the fuel supply. When the fuel supply ceased, the trajectory of the falling rocket could not be affected anymore, although the rudders provided some stabilization. The Czech researcher Jirzy estimates that 17% of the V2-rockets fired at Antwerp failed on launching due to technical failures. Another 18% experienced problems during the flight26 .Therefore merely 65% of the launched rockets landed onto the target dispersed over a large area. the rocket body consists of a framework covered with a light metal fuselage; more heavy parts, such as the pump, were mounted on a steel frame; some parts of the fuselage were compartmented by plywood bulkheads. The alcohol and liquid oxygen were pumped into the combustion chamber by means of two fuel pumps mounted on a common axis. These powerful pumps were driven by a steam turbine with a power of 675 H.P. At full power the pumps had an output of 5000 revolutions per minute. Only this way could the 8.75 tons of fuel be delivered in 6 to 7 minutes. The pumping unit weighed 450 kilogram. 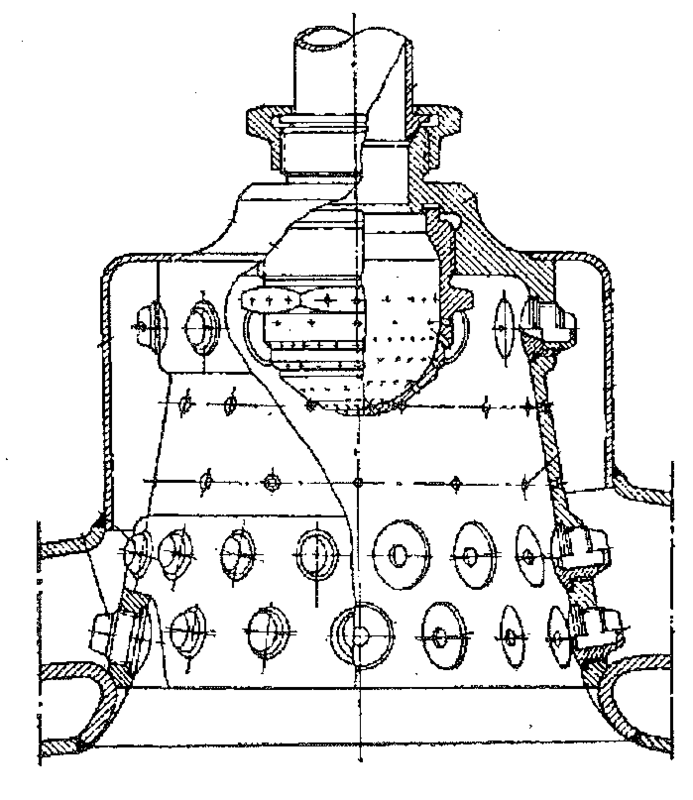 The steam for the turbine was produced in a generator. Hydro peroxide and calcium permanganate were mixed in the generator. The resulting chemical reaction generated overheated steam, which drove the turbines. The turbine pump and the steam generator were the most vulnerable parts of the V2: only one factory at Jenbach in Austria could produce the turbine pumps. This required high precision machines and an eminent production management. The Allies were not aware of this and never employed their strategic bombardments against this factory. The interruption of the supply of turbine pumps would certainly have stopped the production of V2s immediately27. The alcohol and liquid oxygen were vaporised under pressure by the injection nozzles and delivered to the combustion chamber. After combustion, the gases at a temperature of 1700º C expanded in a nozzle, giving a thrust of 27 to 28.000 kilograms, more than enough to propel the rocket. Four rotating graphite vanes in the tail stabilized the rocket during take-off. External aerodynamic vanes could control the direction while the rocket was in flight. Control became necessary, when the gyroscopes would detect differences between intended flight path and actual flight path. View of the propulsion unit of a V2 rocket. The turbine and the steam generator are mounted in the frame; below this the supply pipes to the injectors, which are fitted on the combustion chamber [Ofen]. A part of the liquid oxygen was conducted through ribbed tubes along the outer wall of the combustion chamber to dissipate the heat. Congreve W.: Details of the rocket system. London, 1814 (reprint). Engelmann, J.: V2 Dawn of the rocket age. West Chester, Pennsylvania, n.d.
Hölsken, D.: V-missiles of the Third Reich. The V-1 and V-2. Sturbridge, Massachusetts, 1994. ISBN 0-914144-42-1. Kahn, I.A. : Gunpowder and fire arms. Warfare in medieval India. Oxford University Press, 2004. ISBN 0-19-566526-0. Kennedy, G.P. : Vengeance Weapon 2. The V-2 Guided Missile. Washington D.C., 1983. ISBN 0-87474-573-X. Kokhuis, G.J.I. : Van V1 tot ruimtevaart. De geschiedenis van de V1 en V2. Amsterdam, n.d. ISBN 90-294-5599-3. Kooy, J.M.J. ; Uytenbogaart, J.W.H. : Ballistics of the future, with special reference to the dynamical and physical theory of the rocket weapons. Haarlem, 1946; New York-Londen, 1946. Nedham J.: Science and civilization in China. Vol. 5, part 7: Military technology – the gunpowder epic. Cambridge, 1986.